Complete Custom Pack magicFlyer: 1 personalized card + 1 personalized Magic Flyer® + 1 envelope. This incredible Butterfly Magic Flyer flies out of your mailings, brochures, invitations, cards and much more! 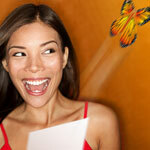 The Magic Flyer energizes your communication by creating emotion... the butterfly effect!